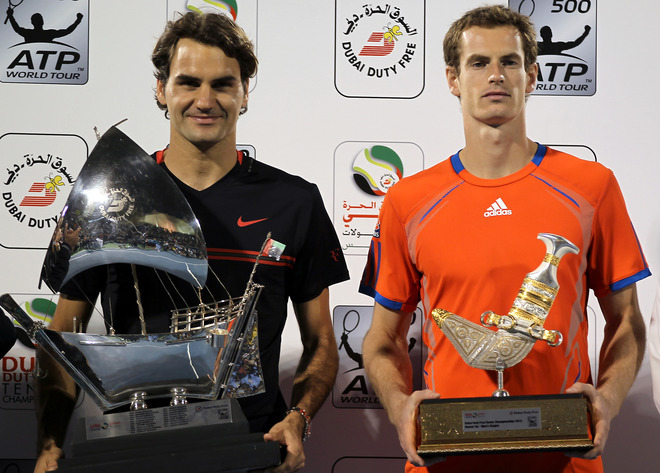 Roger Federer took on Andy Murray in the 20th final of the Dubai Duty Free Tennis Championships. As in almost any match the Swiss maestro plays, he is making history. Today would be no different. Federer, in his 102nd career final, came out victorious over Murray, 7-5 6-4. It is the 5th title in Dubai and 72nd career title for the Swiss. With today’s win, Federer narrows the head to head to a 8-7 lead for Murray, with all meetings played on hard courts. However, Federer leads 4-2 in finals and 2-0 in grand slams (2008 US Open final, 2010 Australian Open final). Always a tug of war in tactics between the two, both players came out playing well, on serve until 5 all, where Federer missed on four break points before converting the fifth chance. He then quickly served out the first set, and won 12 of 13 points in a row early in the second set, breaking Murray’s serve in the process. Murray broke back however, marking the first time Federer’s serve was taken to deuce in three matches and the first time he was broken all week. Carrying on at 3 all, Federer found his opening again at 4 all, and used his inside out forehand to break. The Swiss maestro then served out the match on his second championship point, hitting an inside out, laser forehand in the corner. 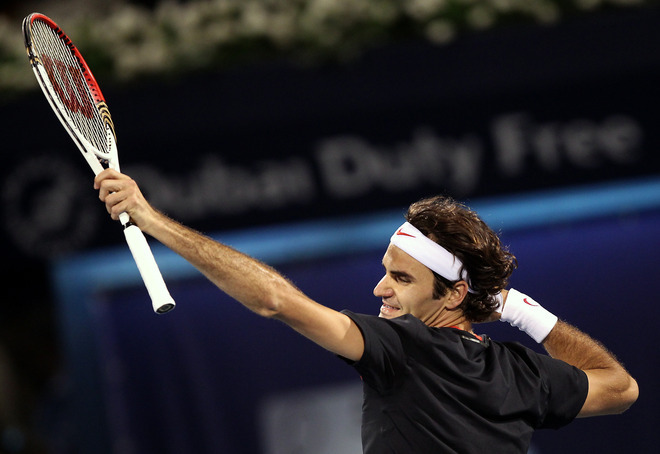 Arms up and punching the air, Federer was victorious and has now won back to back titles in 2012 (Rotterdam, Dubai). The Swiss maestro did not drop a set in Dubai and is in good form heading into Indian Wells next week. He has accumulated the most ATP rankings points since the 2011 US Open (Federer 4810, Murray 2950, Djokovic 2560, Nadal 2200). Since turning 30, Federer is 41-5, with 5 titles. Next for Federer is the BNP Paribas Showdown at Madison Square Garden on Monday, March 5. He will participate in the exhibition with Andy Roddick, Caroline Wozniacki, and Maria Sharapova. Following the exhibition is Indian Wells. 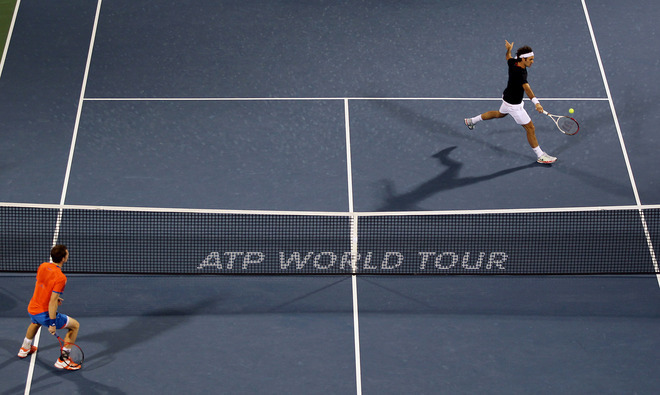 Keep track of the Swiss maestro’s full schedule with RF Activity.